It rises to our hot air balloon, overflies the clouds and passes through majestic Teotihuacán temples and pyramids. You will see the impressive architecture of Central America from two opposite angles: from the ground level and from the air. You can verify in person the immensity of this valley and take an indelible memory of this visit. We will start punctually in the morning to take advantage of the best time of the day to contemplate the sunrise over Teotihuacán. 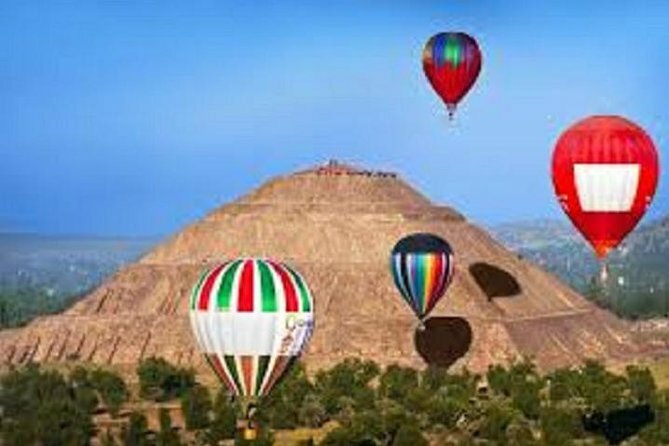 Observe how the balloon inflates with hot air and start your adventure flying over the great pyramid of the Sun, the alley of the dead, the palace of Quetzalpapalotl and the pyramid of the moon. Do not forget to photograph all the corners of the most visited archaeological deposit in Mexico, considered a UNESCO World Heritage Site. When you’re back on the ground you cover the place on foot and enjoy its spectacular nature from a completely different angle. It is required to be punctual at the time requested for your flight, if possible to arrive between 15 and 10 minutes early to register your assistance and prepare them to board the Balloon. The passenger has 10 minutes of maximum tolerance after the scheduled time, after this time the duration of your flight will decrease. In case of shared flights out of respect for other passengers, Globo will take off without you and there will be no refund.